Alert Janeite Lisa G. sent us a link to a post at Jezebel deconstructing a recent episode of the Glenn Beck Show in which he mentions Jane Austen, and not in a complimentary way. Now, we know that Janeiteville is a really big tent with a remarkable cross-section of people of all backgrounds. We’re sure some of our readers are big fans of Glenn Beck, and we are not here to comment upon that. We are only here to respond to the comments about her work that he makes in this particular program (and we beg our Gentle Readers to do the same). You think of um, movies, from, you know, like those stupid bonnet movies, that, what’s her name, Emma Thompson is always in, those awful, you know, OOOOOOOHHHHHHH, Jane Austen, ugh, but anyway–sorry ladies–tortuous! But you see that, and they’re always so prim and proper, ‘oh, I don’t know if the captain will come home this week,’ and finger sandwiches, and that’s it. Um, what? *hefts Cluebat of Janeite Righteousness* For a program that was given to an entirely female audience, this does not seem to be the way to go about winning friends amongst the Janeites; and it does not seem to be the way to win confidence from one’s audience, by belittling their entertainment choices and by belittling the work of a woman who did not take the view that many of her generation took–marriage with the first eligible man who comes along being “the only honourable provision for well-educated young women of small fortune”–and instead courageously sells her work and carves out a small living in a society that did not value fiction overmuch, especially that written by women. And we’re still reading it two hundred years later, which should tell you, if you’re paying attention, that it’s more than bonnets and finger sandwiches. Do we have to bring out the line from Miss Austen Regrets again? “If that’s what you think Aunt Jane’s books are about, then you need to read them again.” Not that it appears that Mr. Beck has ever read them in the first place. “The men all so good for nothing, and hardly any women at all.” That was published in 1817. Revisionism, indeed. Now pray excuse us while we swing the Cluebat of Janeite Righteousness for the fences. I take little that Glenn Beck says seriously because, in my opinion, most, er, everything he says is garbage. ugh, what an idiot! I notice the audience is suspiciously quiet. Very little applause, very few people laughing at his lame jokes. I’ll bet his wife makes him wrap all the Christmas presents this year. Hopefully, in Jane Austen wrapping paper. Our great land still dangles the promise of the American dream in front of the masses, for even the likes of a Glenn Beck can make tens of millions per year shooting nonsense from the lip. I agree that Glenn Beck gets a little crazy at times, but he’s more on track that those whose heads are buried in the sand while our USD goes down the drain, any common sense regarding health care is arrogantly sneered at, our economy has gone to an 80% service oriented economy, which means we create very little wealth anymore – and unemployment is skyrocketing while the Prez. wants to ban drilling for oil, eliminating even more jobs. Yet he’s great at sitting in Washington and pontificating from the Oval Office (with the help of a teleprompter, of course). So go ahead and pretend like the Conservatives are a bunch of looneys – but you might just want to keep quiet long enough to actually listen to what they have to say before your dollar won’t buy you a stick of bubble gum. Get away from the TV news, read, and THINK, people! As far as Jane Austen goes, anyone who simply has watched the movies but hasn’t read the books could get exactly the same impression – a bunch of silly women in bonnets, giggling behind their fans. 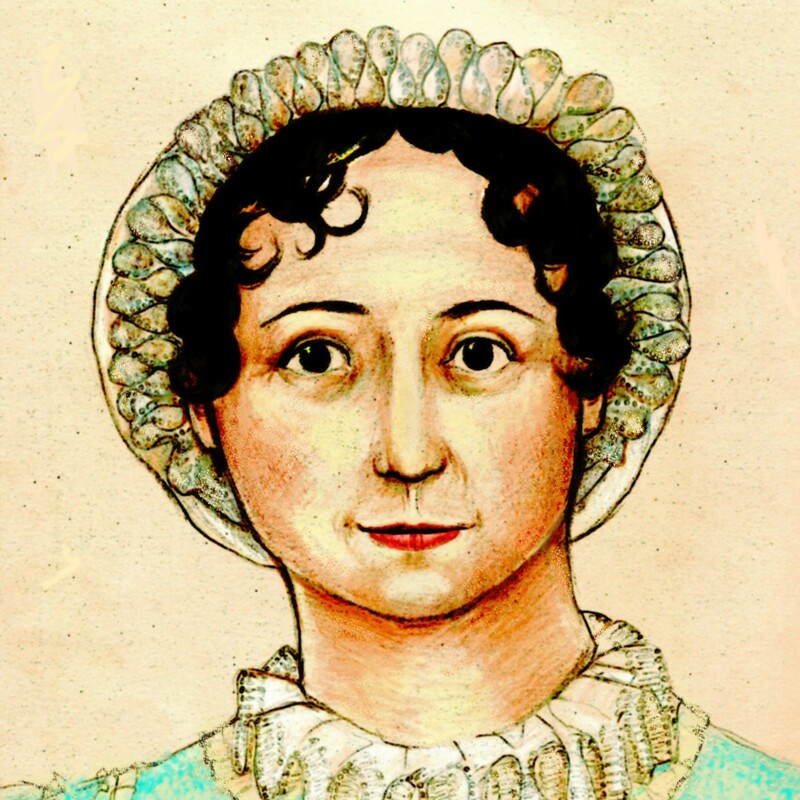 It’s the WRITING of Jane Austen that is so fantastic – and that’s what made the stories so good in the first place. Thanks. That’s exactly where I didn’t want this discussion to go. We are talking SOLELY about Glenn Beck’s comments about Jane Austen, not U.S. politics in general, which had nothing to do with the example. Further comments in this vein (from either side of the aisle) will be subject to disemvowelment. Hint: your last paragraph is fine, though I disagree with it. Th frst sx cmmnts wr dsprgng f Glnn Bck, bt s s bcmng tpcl n ths cntry, frdm f spch nly wrks n wy. Some of the previous comments are on the edge, yes, but they at least obliquely acknowledged that the original post was criticizing the comments about Jane Austen. If you had praised or agreed with his comments without the off-topic side rant, which is what I asked nicely in the original post that commenters not do, that would have been acceptable. Like I said, the last paragraph of your comment was fine. Also, you might not have noticed, but I have prevented anyone from countering your comment here. The merits of your argument or lack thereof aside, AustenBlog is not the place to have that discussion. “Finger sandwiches”…..oooh, the zombie-lovers out there missed out on that late-Victorian cultural reference….. I suspect that 200 years from now, people will still be reading Jane Austen, while the words of shallow blowhards like Mr. Beck will have been consigned into well-deserved oblivion. I’m pretty sure Ms. Austen will have the last laugh. um…uh…this Glen whatever …..is someone I don’t know, but he must be OOOOOOOHHHHHH so busy making his millions that he doesn’t have the time to read good literature, and perhaps nor does he think its necessary. It sounds like Glenn put his foot in it. I would wager that he hasn’t read Jane and that he was knocking period pieces. He just barked up the wrong tree. I don’t know Glenn Beck but I love Jane Austen for years. Yuck. It’s really sad to see anyone, especially popular media personalities, disparaging anyone without proper information. Clearly, he’s never read Jane Austen, has only seen Austen movie adaptations in passing, and yet still refers to them as “torturous”. I’m sure he wouldn’t be pleased if someone who was only mildly familiar with his show dismissed it as “torturous”. B) your redesign is fantastic!